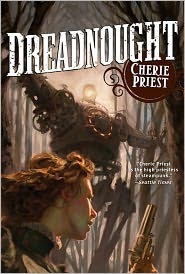 Dreadnought is the second book in the Clockwork Century Series by Cherie Priest, following the, um, groundbreaking hit, Boneshaker. (Sorry, had to do that). While Dreadnought shares the same universe and time period as Boneshaker, and there are peripheral tie ins between the stories, this is not purely a sequel. The main characters are different and where Boneshaker took place exclusively in the Pacific Northwest around Seattle, Dreadnought starts from Richmond, Virginia on a thrill seeking adventure to try to get the main character, a Confederate sympathizing nurse named Mercy Lynch, to Tacoma, Washington to see her long lost father before he dies. Mercy isn’t your typical Southern Belle, and this isn’t your typical Civil War story. Forget about Rex and Scarlet. Mercy has seen a lot of horrible things come into the hospital in Richmond, Virginia during her short time there nursing the battle wounded, but she is good at her job, and has developed an edge to her that leaves her able to handle just about anything. The trip across country by dirigible, horse and train is no cake walk. The world west of the Mississippi is ruled by bandits and contested by no less than three nations. An entire army has gone missing, and rumors are flying that something horrible is happening in Utah. Dreadnought is a pretty good book, but you have to be able to buy into the ‘Steampunk’ way. There were a few times where I wondered why the characters didn’t do ‘X’ or how could this character hear this sound in the distance when they are on a moving train, which, unless trains are a lot quieter in the Clockwork Century, would seem to be difficult to do. You have to be able to suspend your disbelief. If you are reading Steampunk in the the first place, you’re probably more than willing to do just that, and you can forgive small inconsistencies that allow the plot to keep moving. The characters are wonderful, and the images Priest builds are so well done, you can almost smell the coal dust in the air. It is a fine example of not only what Steampunk is, but what it should be. The plot moves nicely and is always climbing, till it reaches a gruesome climax that keeps you turning the pages. I enjoyed Dreadnought and look forward to reading Priest’s next book, though I may get it once I get an e-story reader. This dang book was heavy, and hauling it around in my bag added just enough weight to convince even a stubborn old coot like me that there are advantages to carrying around an e-reader. Or I may just wait and read it only when I’m stuck at home. Either way, I’m looking forward to the next installment in the series.